Why would iPhone stuck in headphone mode? Perhaps you disconnected your headphones instantly and it triggered the issue. Another reason could be disconnecting the headphones at the time when your iPhone is busy. Maybe your headphones are of low-quality and your device is not able to support them, thereby bringing up the issue. A jack in bad condition may also be the reason behind headphone mode issue. Let’s now get aware with the 13 solutions below. Always go with genuine Apple Earpods you bought with the box or purchased separately. Most leading brands manufacture headphones compatible with iPhones. So in case you want to choose then make sure that the model of headphones are supported by your iPhone. Stay away of brands that are of poor repute and offer audio devices of low quality. They might corrupt your iPhone and worsen this headphones issue. When you find your iPhone stuck on headphones mode, the possible cause might be that your iPhone hasn’t recognized your headphones were being connected or disconnected. To solve this problem, try connecting and disconnecting your headphones to your iPhone. You must have tried this option before, but there is no harm in retrying. Ensure that you are able to listen through the headphones, when you connect to the iPhone. Stop the music only when you are sure of the issue being fixed. Clear your history by clicking the ‘home’ button twice and shut all the Apps running in the background. 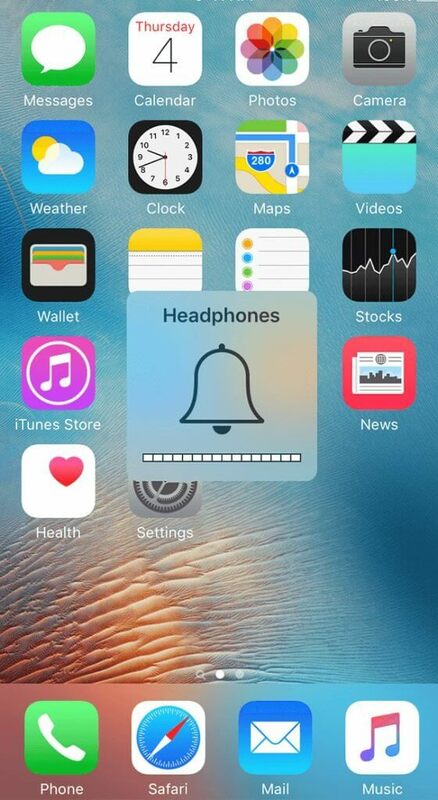 Now remove the headphones from your iPhone. Dust and dirt clogging the audio jack might be another cause of your headphones abruptly pairing with your iPhone. So, we would suggest you this in house trick to fix iPhone stuck in headphone mode problem. Get a cotton bud and clean the headphone jack delicately. Don’t worry, it won’t harm your iPhone in anyway. Now, connect the headphones and groove into your favorite music! iSkysoft Toolbox - iOS System Recovery can help you get rid of iPhone stuck in headphone mode without any data loss. 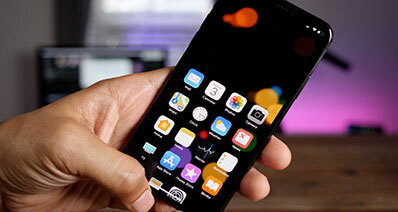 Whether your iPhone screen is unresponsive, screen turning black/green/blue, power off slider is unresponsive, stuck in DFU mode/frozen/white Apple logo/recovery mode, this software program can fix it with ease. The tool holds a very good success rate and therefore is highly recommended and trustworthy way to fix iOS system issues. Download iSkysoft Toolbox on your computer and connect your iPhone to the computer. 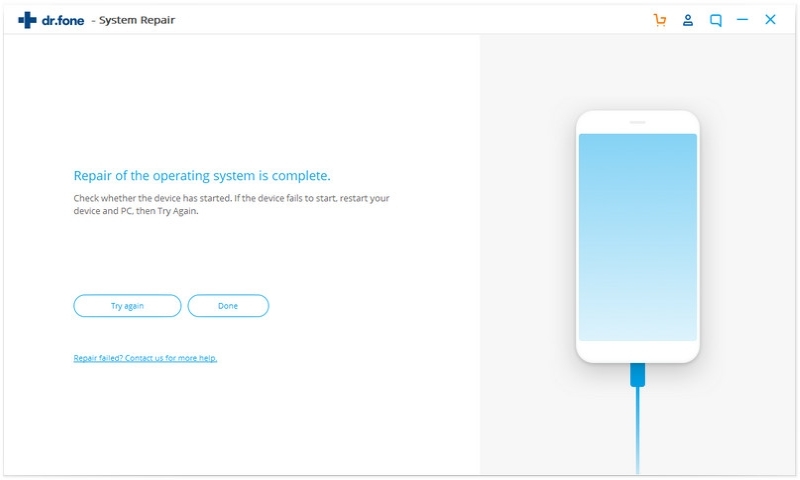 Click "System Recovery" and then "Start". Choose your iPhone model and click "Download". Wait a minute till the software resolve your iPhone stuck in headphone mode issue. Here is an interesting trick to bring out your iPhone headphones out of the iPhone stuck in headphone mode. Start playing an audio on your iPhone and when the iPhone screen is locked connect the headphones with it. Now, pause the music once you unlock the screen. Disconnect the headphones from your iPhone carefully. We are pretty optimistic that it would fix the issue. In case you get trapped with a problem like iPhone stuck in headphone mode, you might need a Bluetooth speaker for your rescue. You can even have a pair of Bluetooth headphones for that matter. Both the devices are wirelessly connected to the audio source, so there is hardly any difficulty in un-pairing them. Get your Bluetooth headphones or Bluetooth speakers. If you don’t have, then borrow it from a friend. Connect your iPhone with the Bluetooth speaker/Bluetooth headphones and play music to ensure that the devices have been paired successfully. Now disconnect the Bluetooth device from your iPhone and plug in your headphones. We hope the issue is resolved now. You might be wondering that how on earth airplane mode is connected to fix iPhone stuck in headphone mode issue. You read it right. 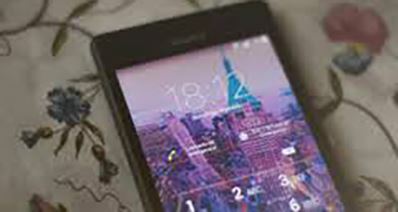 By turning on the airplane mode your device stays on but without any internet/Wi-Fi-/cellular network connectivity. 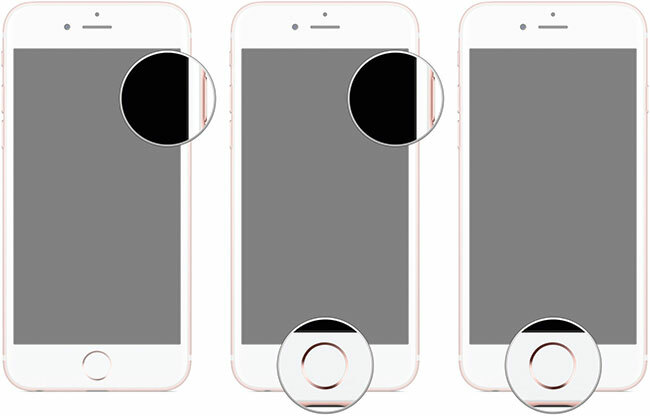 Sometimes toggling it on and off can resolve the headphones mode issue with your iPhone. Swipe up on the ‘Home’ screen to enter ‘Control Centre’. Tap on the ‘Airplane’ mode button to turn it on. Now wait for almost 15 minutes and turn off the ‘Airplane’ mode by re-tapping. 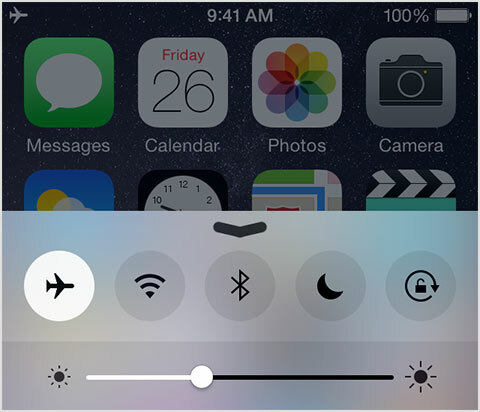 Go to ‘Settings’ and turn on ‘Airplane’ mode by tapping it. Wait for around 15 minutes in this mode. 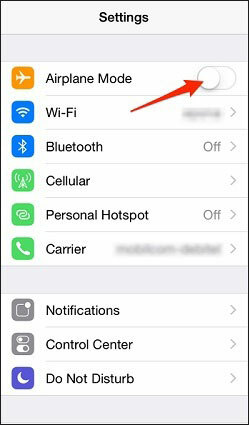 Now, turn off the ‘Airplane’ mode and check whether your iPhone is out of this headphones stuck mode. When you are trying to play music or watch any video and your iPhone stuck in headphone mode, obviously you will feel disheartened. Worry not! The simplest solution to such an issue is restarting your iPhone. 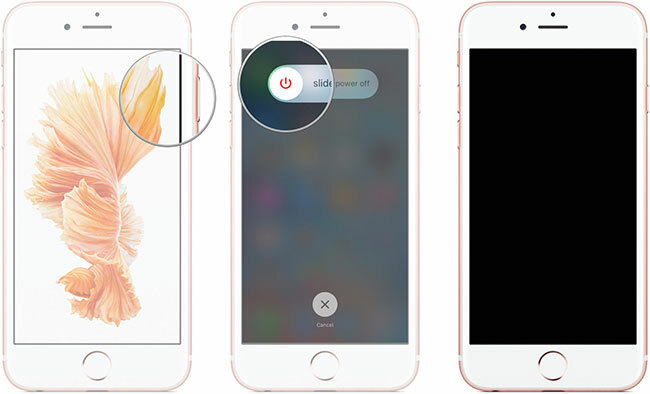 To do so – push and hold the ‘Sleep/Wake’ button and drag the red slider to turn off your iPhone. Now, press and hold the ‘Sleep/Wake’ button to switch on your iPhone. When you experience iPhone stuck in headphone mode, another solution to fix iPhone stuck in headphone mode is putting your iPhone into DFU mode and restoring it. In DFU mode restore, all the iOS files which are corrupted or outdated get replaced with latest software and fixes all underlying issues. Press the ‘Sleep/Wake’ button and hold it that way for 5 seconds and hold the ‘Home’ but together for another 15 seconds. Lift your finger from the ‘Sleep/Wake’ button but let the ‘Home’ button stay pressed. 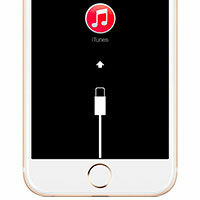 Now, your iPhone will enter the DFU mode and ask you to connect your device with iTunes. 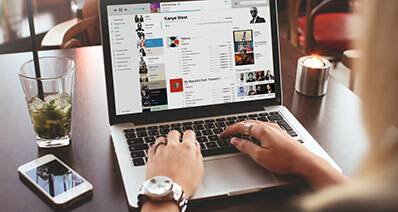 Connect the devices and let iTunes do its wonders. When your iPhone runs into iPhone stuck in headphone mode, you can actually fix it without much effort. You can use the power button and you are all set to rock! Connect a genuine Apple headset to the audio jack of your iPhone, when the iPhone screen is in lock mode. Push and hold the ‘Sleep/Wake’ button until the ‘Slide to power off’ bar on the top. Now unplug the headphones and click ‘Cancel’. It should fix the headphones related issue. In case you have put an iPhone case to protect your iPhone, chances are high that it is the main culprit behind the iPhone stuck on headphones issue. The case might be little tight around the audio jack and preventing a proper connection between your iPhone and the headphones. A disrupted or improper connection might be showing the headphones icon on your iPhone but hampering audio transmission. To resolve this problem, you have to get rid of the iPhone case and choose a suitable one. The new case should allow ample room for the headphone to connect and hence prevent the iPhone from getting stuck in headphones mode. If you are facing iPhone stuck in headphone mode kind of problem, resetting all settings might be one of the best ways to fix it. This will take your device to its original factory defaults and remove all the glitches along the way. Click on ‘Settings’ and choose ‘General’. 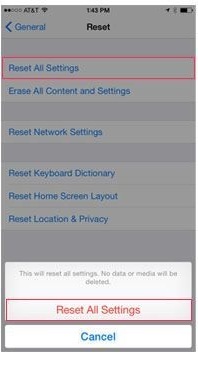 Now, tap on ‘Reset’ and go for ‘Reset All Settings’. Confirm your selection and the iPhone will get reset to its original form, fixing the headphones related issues.